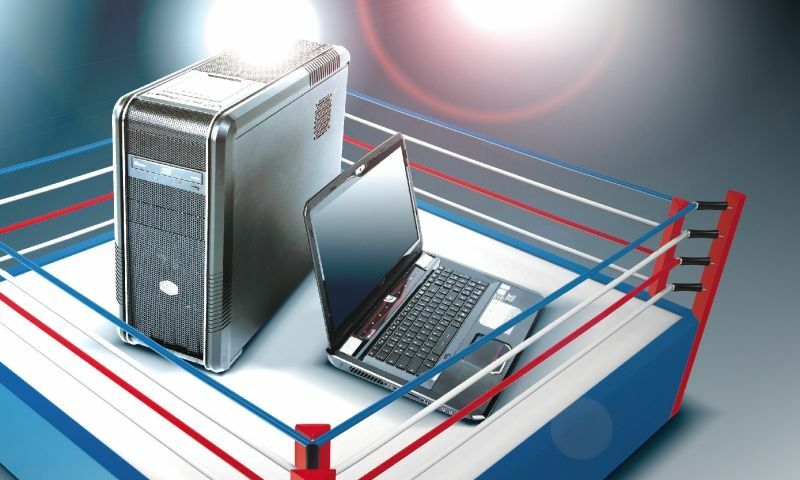 The short description in the battle of desktop vs laptop computers as each of their names indicate is as follow. A desktop refers to the style of computer that sits on top of a desk or under it. They are stationary and there are many different styles and sizes. A laptop is a small portable computer that you can carry anywhere you go. They use a rechargeable battery that allows you to use them on the go if power is not an option. Now lets find out in more detail about each of these devices. A desktop computer is a stationary computer that comes in many sizes and shapes. This is the typical computer tower with its monitor, keyboard, and mouse that make up the device as a whole. The term desktop-computer initiated when the design of the computer case was wide and flat which allowed the case to lie horizontally on your desktop and the monitor on top of the case minimizing the space taken in your work area. Typically desktops are meant for higher end functionality as opposed to laptops although now days, laptops are so powerful that they could replace desktop computers all together for most user at home and at the office depending upon your need. They are less likely to get stolen because they are big and always in the same place. You can upgrade the components inside the case to maximize speed at low prices. Desktops are typically faster than laptops. You can build and customize your own computer. They can be affordable depending on what you are buying them for. A laptop computer is a small, all in one device, small enough to fit in a briefcase when on the go and sit it on your laps when needed. It is important to note that laptops are also mistakenly referred to as note Books but both terms refer to two different devices all together. Although both computers can sit on your laps, there are some differences between the two. Lets look at the differences of each of these computers. They are larger in size. Typically between 14 - 17. Laptops are higher end computer meant for higher functionality than notebooks. They can also be hardware upgradeable. They are smaller than laptops. Smaller size keyboard which retains some functionality. They are meant for light tasks. They are small and convenient. You dont need a desk to use them. They are capable of handling the same tasks of a regular desktop. With the exception of most Macintosh laptops (Macs), they are affordable. A tablet computer is a device which popularity comes from its unique touch sensitive screen. They are even smaller than laptops or notebooks due to its design making it also more portable. They dont require a mouse or an extended keyboard since they are touch screen and your fingers become the mouse. They use a digital keyboard that displays on the screen and you can activate at any time when typing is required. The iPad is a good and very popular example of a tablet computer. Desktop vs laptop - Now that you understand the differences between a them our next topic will take you through the parts of a computer.